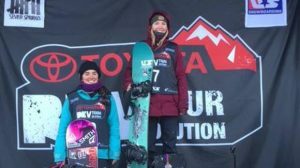 Seven Springs, PA – The American slopestyle snowboarders swept both podiums at the final stop of the Toyota U.S. Revolution Tour in Seven Springs on Friday. Nora Healey (Plymouth, N.H.) and Lucas Caye (Minneapolis, Minn.) also claimed the overall Rev Tour slopestyle titles for the year. Healey was the winner at Seven Springs for the women; it was her second Rev Tour win of the season, as she also claimed victory at the first event of the year at Waterville Valley. She was joined on the podium by Tealor Mattingly (Sandy, Utah) in second and Isabella Gomez (Issaquah, Wash.) in third. For the men, it was Derek Lemke who topped the podium. Sean Fitzsimons (Mt. Hood, Ore.) took second and Jack Coyne (Vail, Colo.) rounded out the podium in third. As the Seven Springs stop of the Toyota U.S. Revolution Tour also served as a stop on the 2017 World Rookie Tour, six qualifying athletes earned a spot at the World Rookie Finals in Austria in April: Taelor Mattingly, Isabella Gomez, Addison Gardner, Derek Lemke, Sean Fitzsimons and Jack Coyne. A chance to earn valuable FIS points as well as World Snowboard Tour points, the Revolution Tour is an important competition tour for elite up-and-coming athletes.